All things begin somewhere and Jesus’ directive to “consider the lilies” was a metaphor intended to illustrate that God will provide for those that trust in Him, but this guy has taken the phrase quite literally! This character, thickly layered in clothing, is something of an archetypal doofus: blundering through life, if not the field of wildflowers itself, but genuinely trying to improve himself. His gaudy attire suggests that his priorities might be a bit skewed (a great deal of toil and spin), but his heart is in the right place and if Jesus said to consider the lilies, then he’s darn well going to do it. 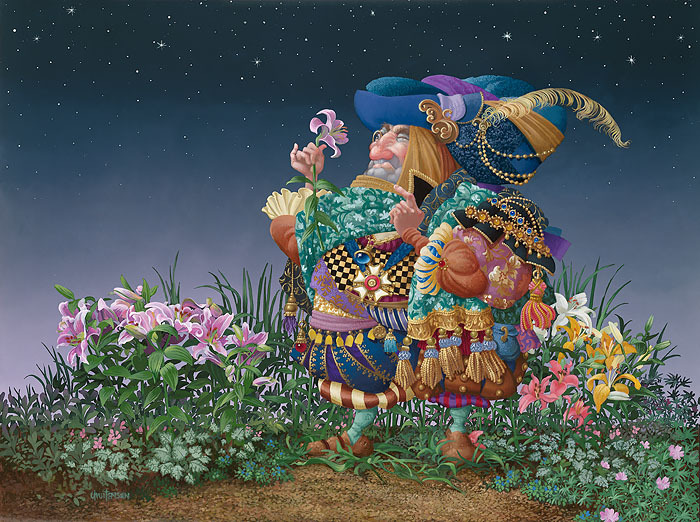 James Christensen’s Consider the Lilies Fine Art Limited Edition Canvas carries an inspirational message of faith and is a work of beauty and good humor as well.